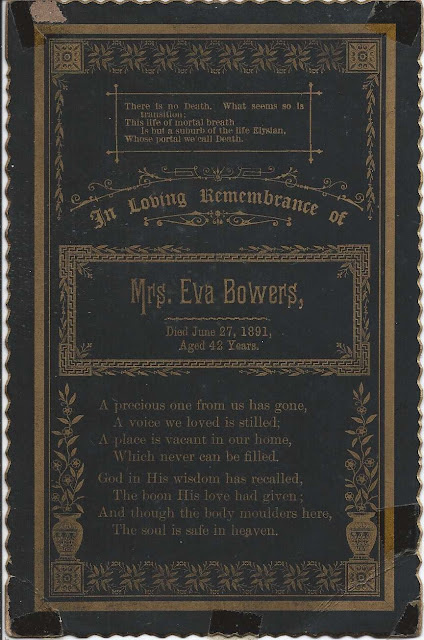 Memorial card printed on the occasion of the death of Mrs. Eva Bowers, who died 27 June 1891 at the age of 42. Researching online, I found a possibility for Mrs. Eva Bowers, an Eva who was married to Charles W. Bowers of Ohio. This Eva, possibly born Eva Uln/Ulin, was born about 1849, but I haven't yet found a death date or a sourced maiden name for her. If you have knowledge of a Mrs. Eva Bowers who died in 1891, please leave a message or contact me directly.